Terence O'Neill was born in London, the son of a Member of Parliament for Mid-Antrim at Westminster. When he was only three months old, his father was killed in the First World War. He was educated at Eton and became an army officer. In 1946 he was elected representative for Bannside, and from 1953 to 1956 was Deputy Speaker. 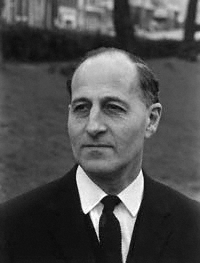 For the next seven years he worked for the Ministry of Finance, and from 1963 to 1969 Captain Terence O'Neill was Prime Minister of Northern Ireland. He resigned in 1969 and returned to England. He became Lord O'Neill of the Maine and died in Hampshire.